Publicizing your screening is important to ensure you get a good turnout, and also so the purpose and objectives of your screening are clear. Be sure to schedule ample time (at least 1 month) to promote your screening. Good buzz takes a while to gain momentum. Don’t target just one place when promoting your screening as not everyone who will be interested in attending will necessarily be reached by the same methods. Below are three broad methods for publicizing your screening, which can all be used together for best effect. Online outreach is a very efficient way to reach your audience, but it’s not enough to simply put something online and hope people find it. You still need to target your message. 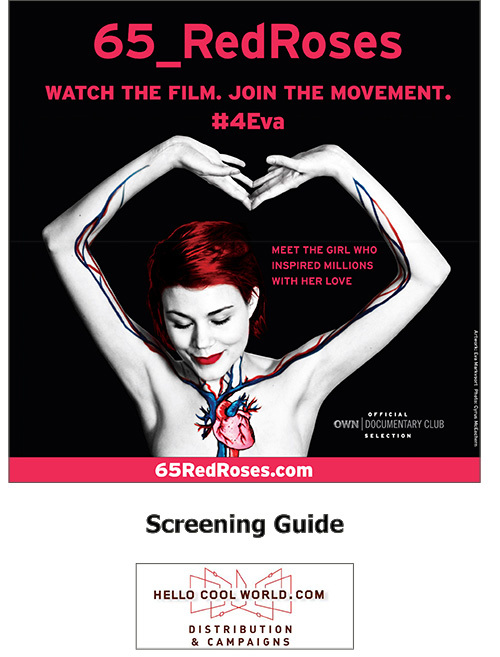 The 65_RedRoses Facebook Page, Twitter and website are excellent places to publicize your screening. Contact us and we’ll help you get the word out! Create an event on Facebook and invite your network. Ask them to share the Event with their own networks. Include all the relevant information (location, time, cost, how to purchase or reserve tickets, and the purpose of the screening), and use a movie poster for the image. Reach out to bloggers and active “tweeps” in your community who can help you publicize a screening. Asking them to share or re-tweet a link to your screening details can help reach their audiences as well. Send out a newsletter. Email your networks and ask them to spread the word. Check out the Screening Materials page on our website! Email anyone you think might be interested, and be sure to let them know how they can help you spread the word. If your event is affiliated with another organization or group, make sure they send out the e-flyer or an email to their members as well. Local media, such as daily or weekly community newspapers, are a great way to reach a large audience. However, they get a lot of requests and press releases each day so it’s important to be organized and persistent in your communications. Create a press release. Play up any local angles and tailor it to the medium. Research the email addresses or phone numbers of your local arts, community, and news editors. Be sure to send them your press release at least ten days before the screening. Be personal in your emails. Address the editors by name, explain why the event would be a good thing to include in their publication, and provide your contact details for questions, in addition to your press release. Always follow up your email with a phone call within the next 48 hours. Weekly or daily papers have dedicated sections that list local community events, to which you can submit your event at no cost. It’s a good idea to try and get your screening listed in as many media outlets as possible. Find the contact information for the individual or department in charge of event listings. Often they will have a form or guidelines for information to include. If you submit the information online, call within 48 hours to follow up and confirm that the appropriate person has received it. Be sure to send your event details at least ten days in advance. University papers are good places to publicize events, especially if your target audience is students. Don’t forget about online media and bloggers! They may reach different audiences than traditional print media. Send your press release to radio and TV news editors, as well as print media. Follow up to inquire about a radio or TV interview. TIP: Approach local media (print, TV, radio, bloggers) to come on as media sponsors for your event. Consider offering a few free tickets for on-air and online giveaways. Distribute flyers to relevant local organizations such as your local hospital, health centre, schools and universities, or doctors offices. If your screening is part of another event, or is taking place during an awareness fair or week, be sure to hand out flyers at the related events. Don’t just drop off flyers: ask permission to put them up and explain what the screening is about. Many businesses will let you put up posters in their window or on their community event boards, especially for a great cause. Recruit friends or volunteers to cover different neighbourhoods. Use these posters with a customizable bottom to fill in all the details about your own 65_RedRoses event. We have them in a variety of sizes, and also as an image if you'd like to make your own.